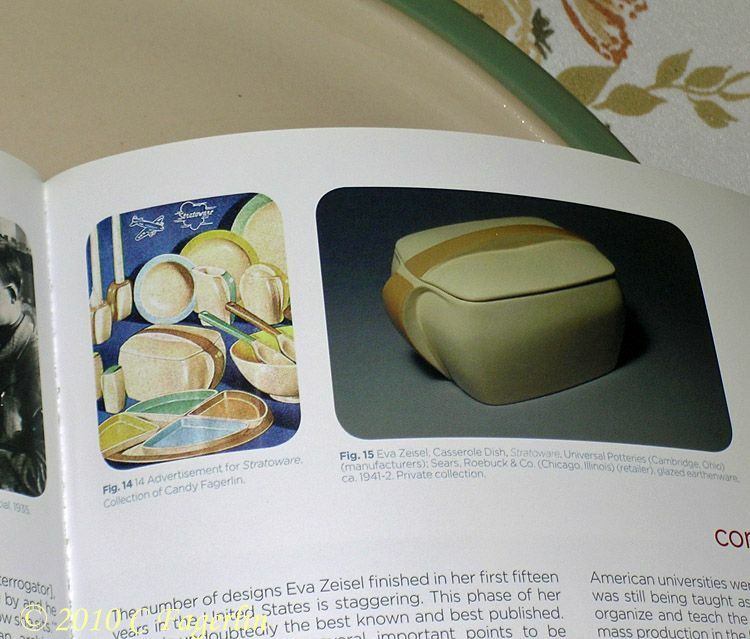 Longtime South Mountain Road resident Eva Zeisel of New City, New York, an award-winning and internationally-known industrial designer and ceramics artist, has died at age 105, according to family friends. 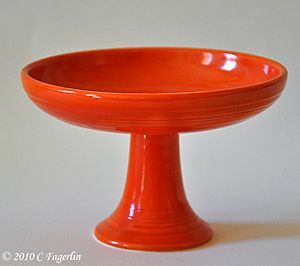 Born in Budapest, Hungary, on Nov. 13, 1906, Zeisel's designs are shown in museums and sold in stores around the world and on the Internet. 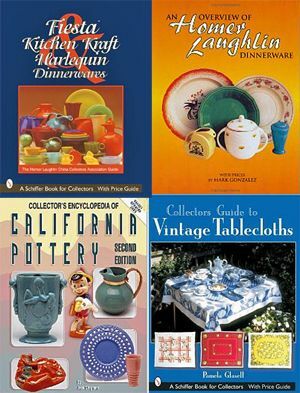 In 2005, she received the National Design Award for Lifetime Achievement by the National Design Museum of the Smithsonian. 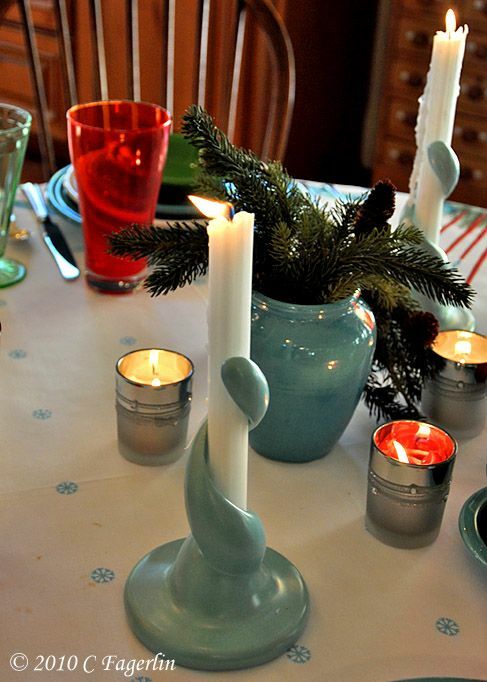 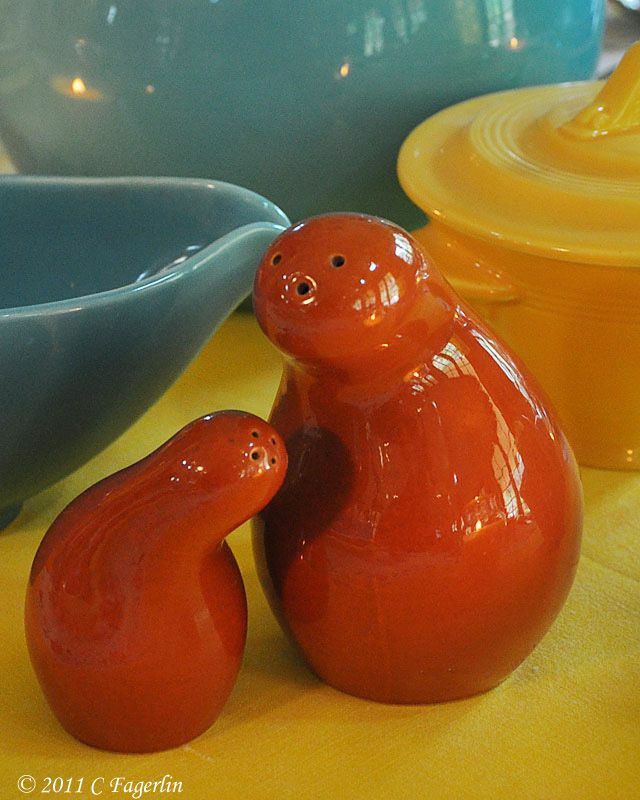 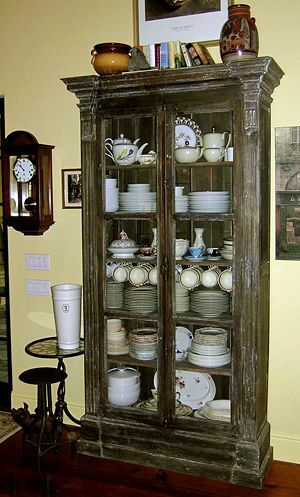 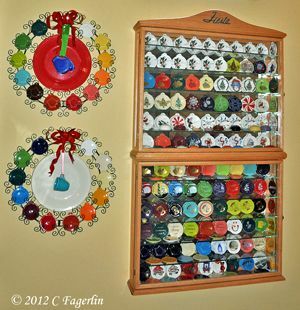 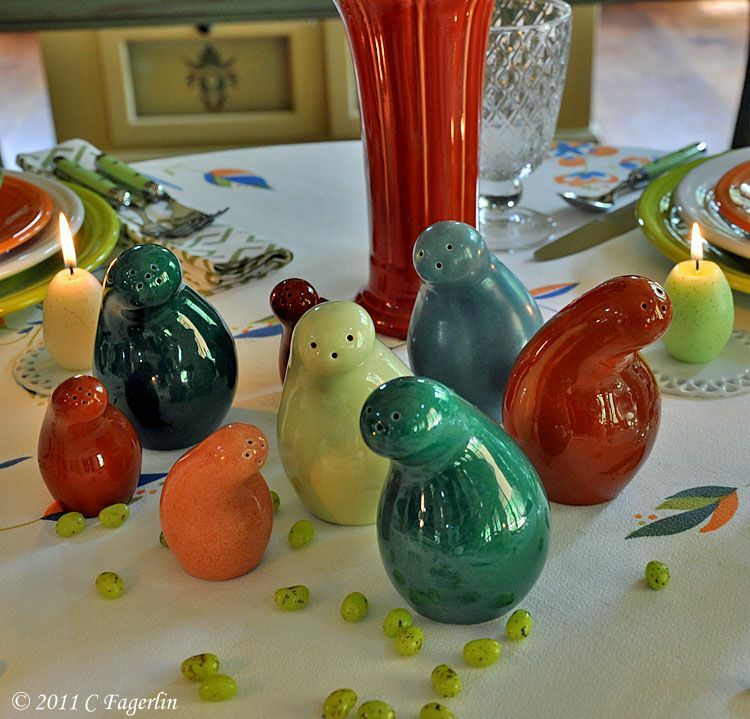 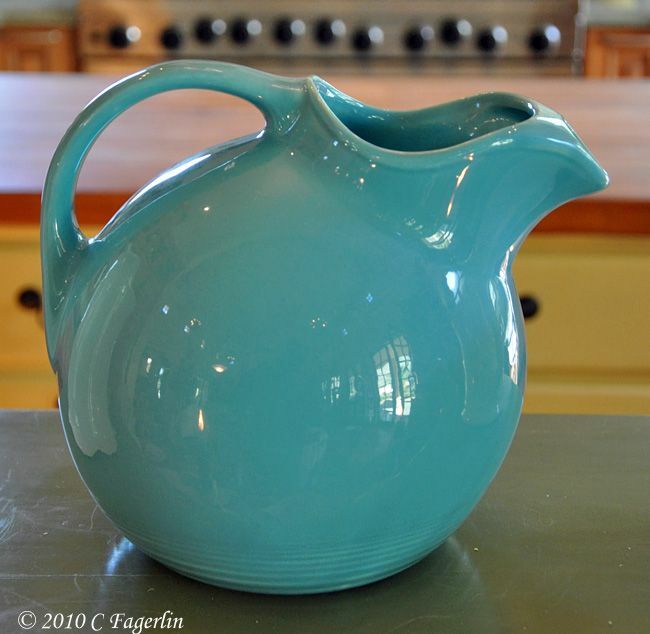 Her work is also sold through a family-run online business, Eva Zeisel Originals. 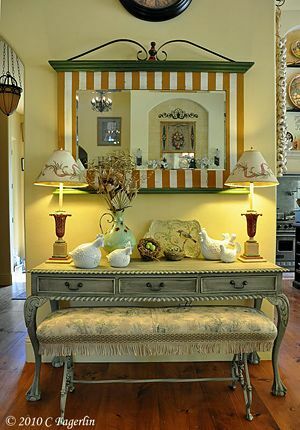 Friends said age did not deter her work. 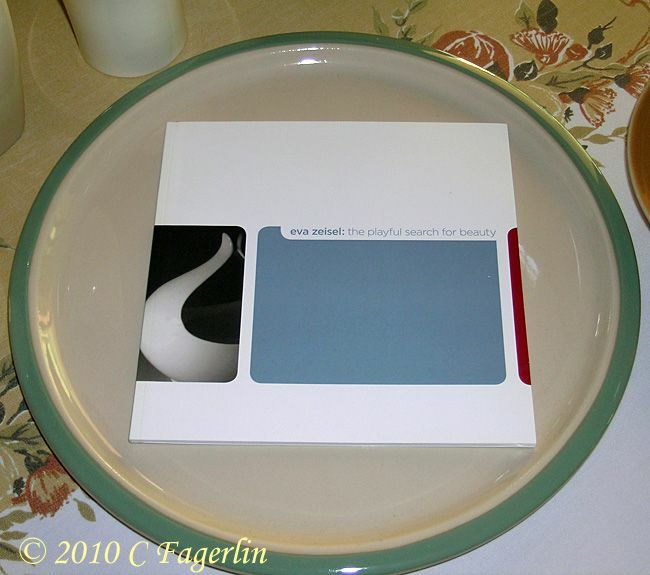 In 2010, two designs released through EvaZeiselOriginals.com — a lounge chair and salt and pepper shakers were featured in Oprah Winfrey's O Magazine. 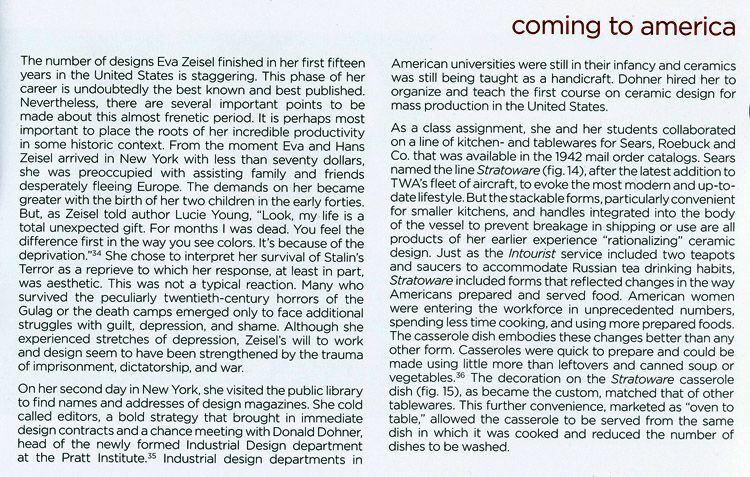 Zeisel was also interviewed for a story in the April 2010 magazine about the sources for her continuing inspirations. 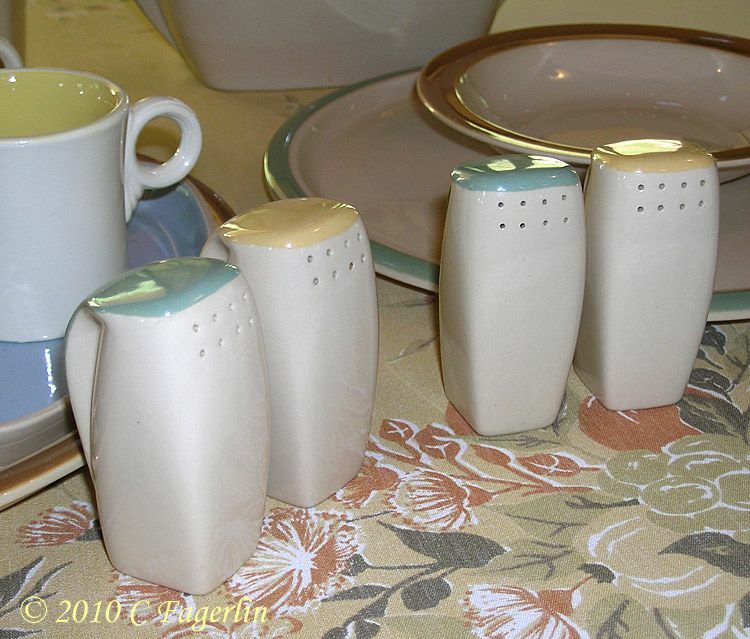 showing some of the pieces in the line. 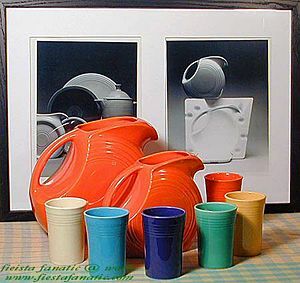 at the Knoxville Museum of Art back in 2004. 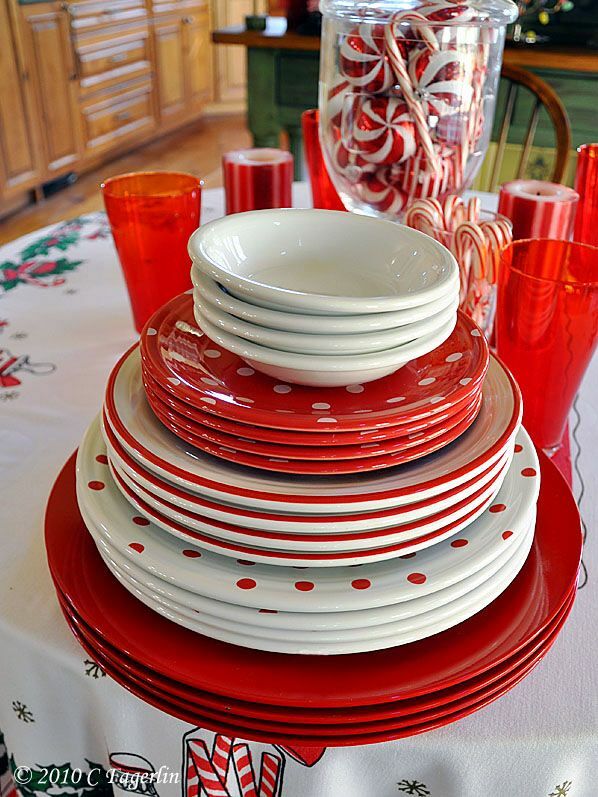 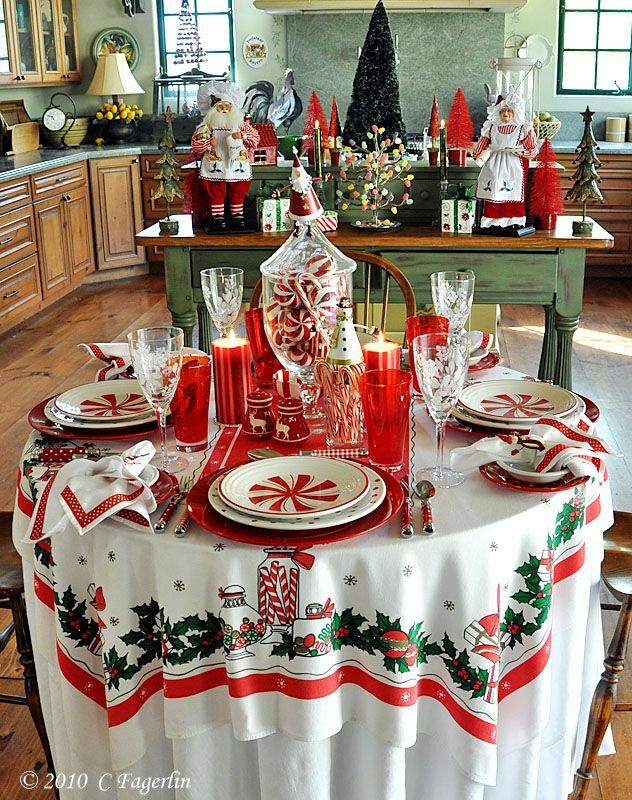 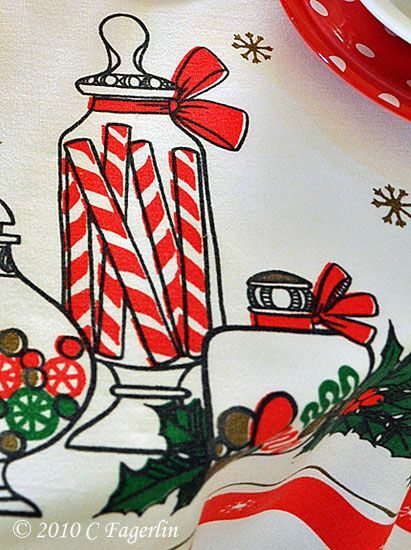 Today's offering from The Little Round Table also brings you contemporary Peppermint Fiesta, along with the Holly and Ribbon pattern and the new Polka Dots, which is exclusive to HLCCA. 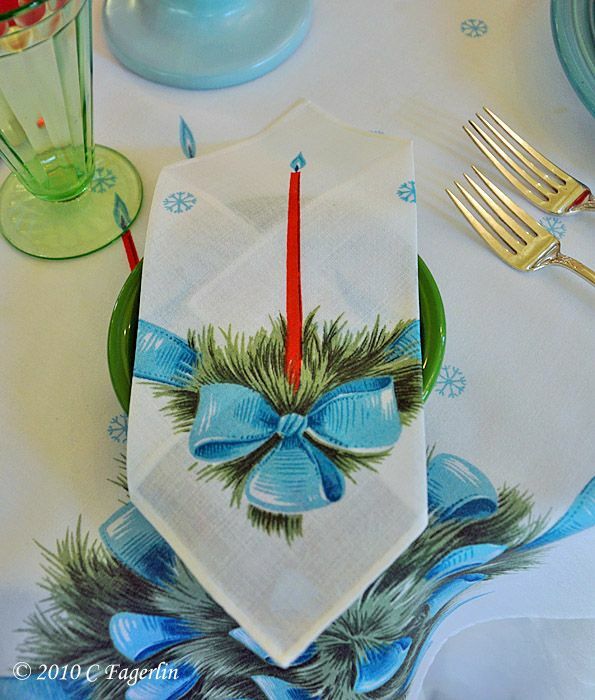 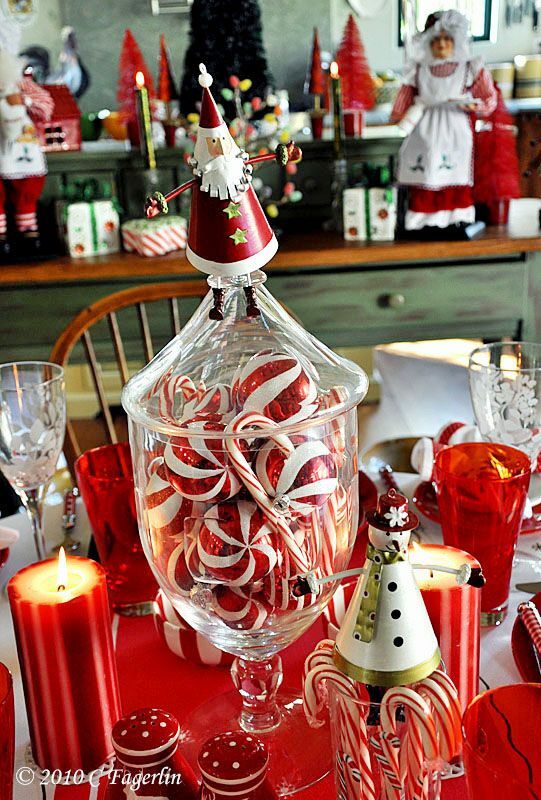 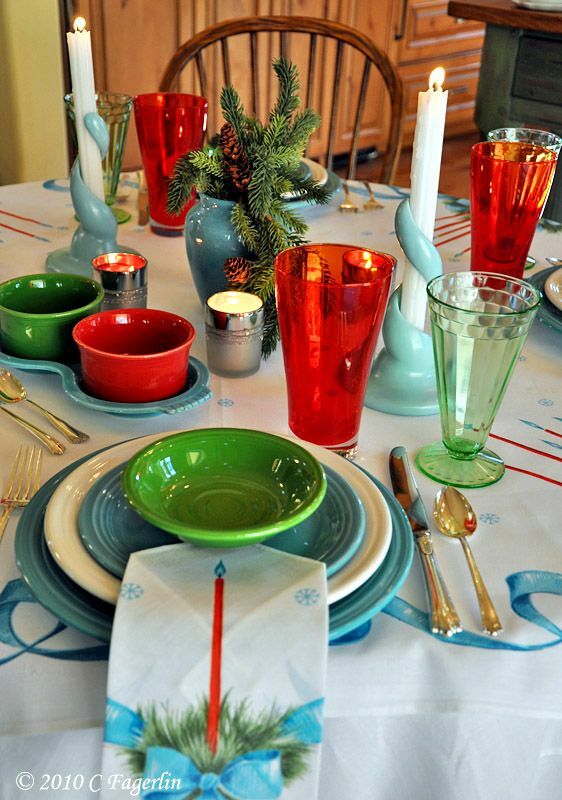 The tablecloth is vintage, candles, shakers, and goblets are Pier 1, apothocary jar, napkins and red tumblers from Home Goods. 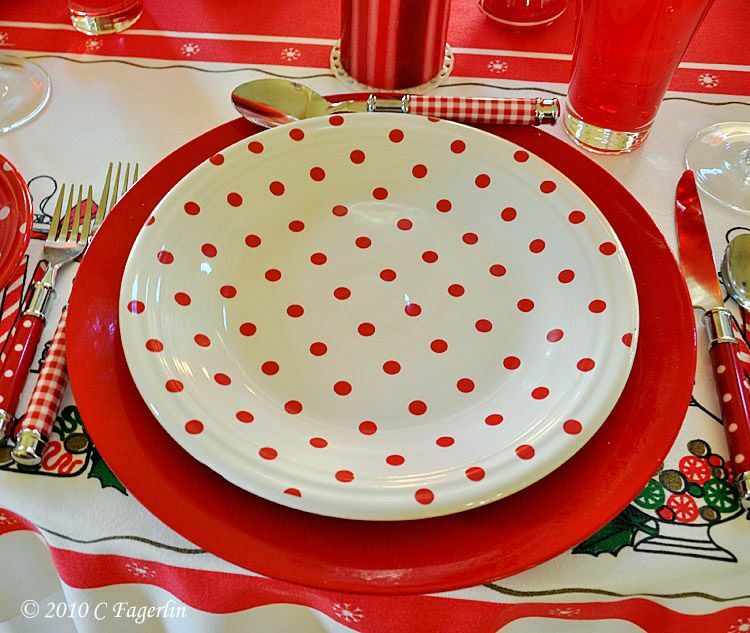 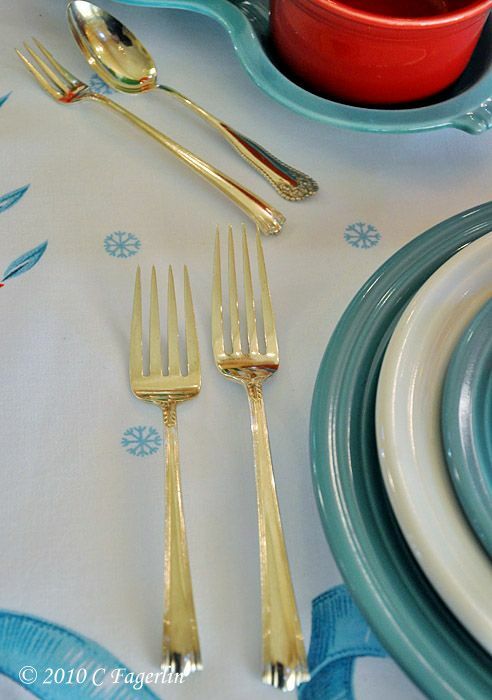 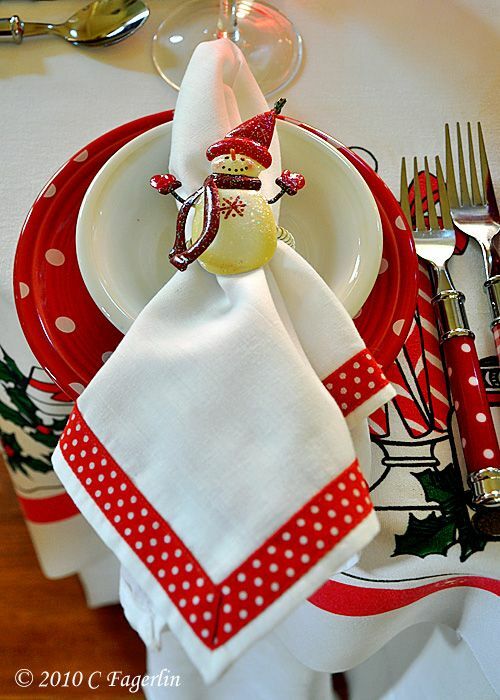 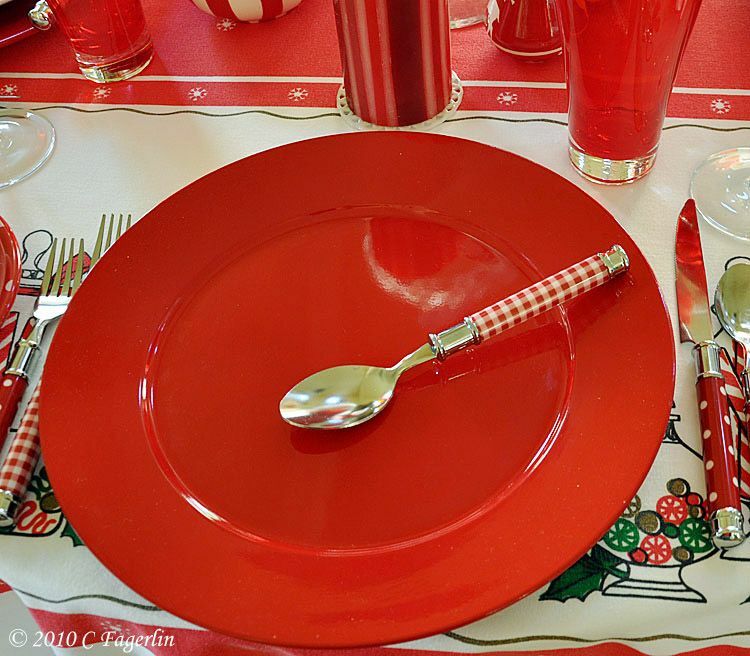 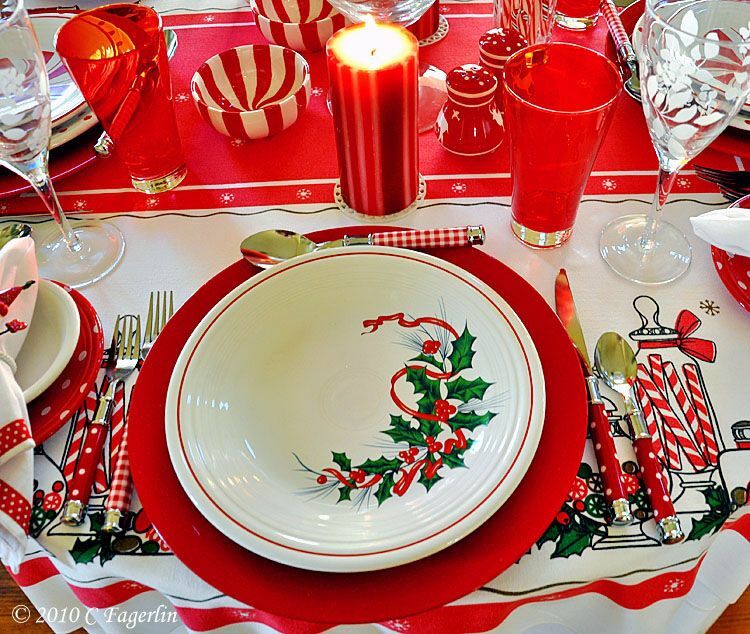 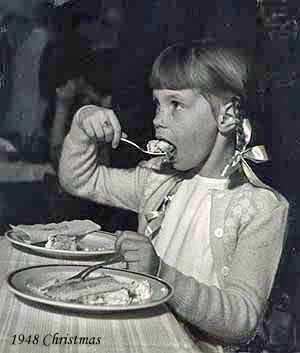 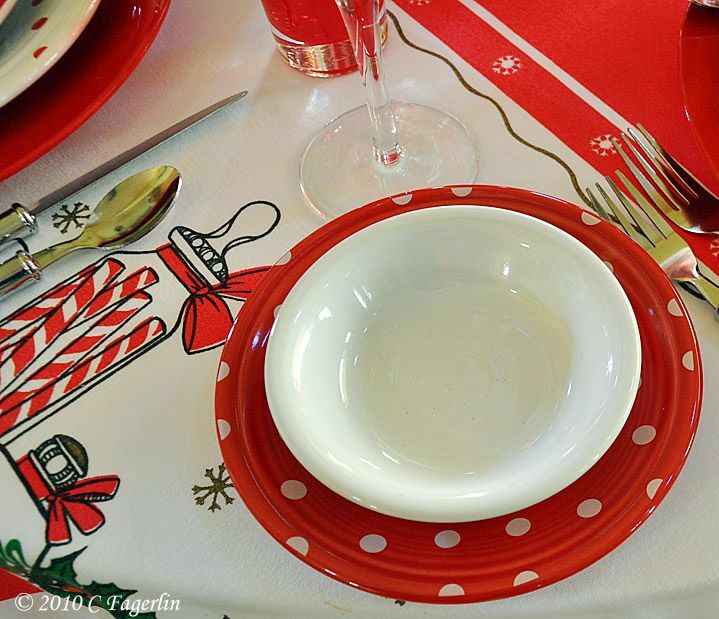 The hard to find holiday flatware is by Cambridge and is variously called "Dot Gingham" or Duplex "Happy." 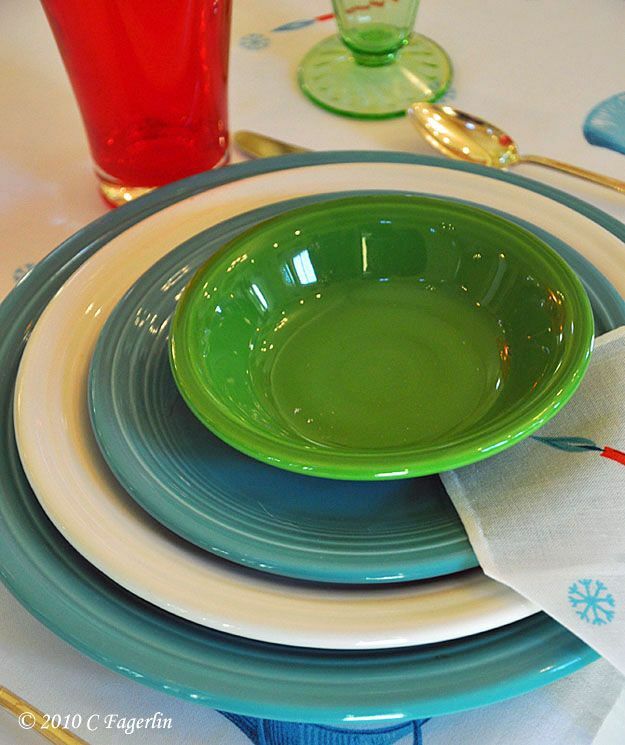 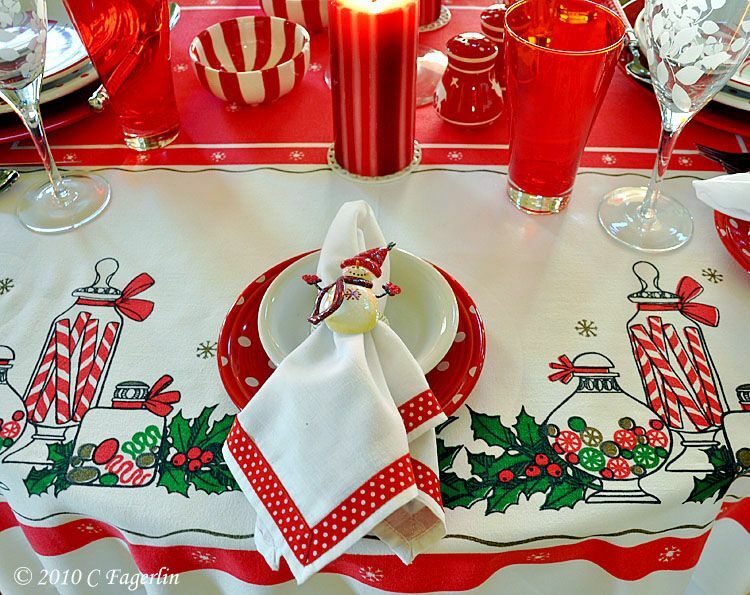 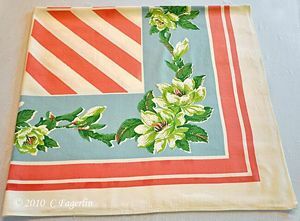 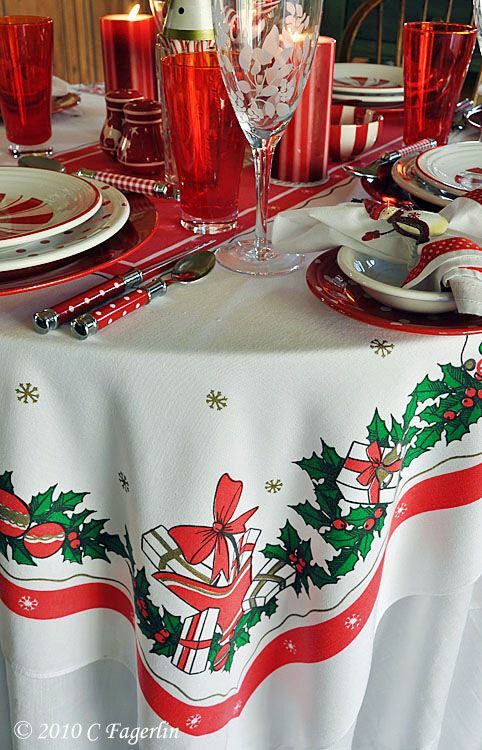 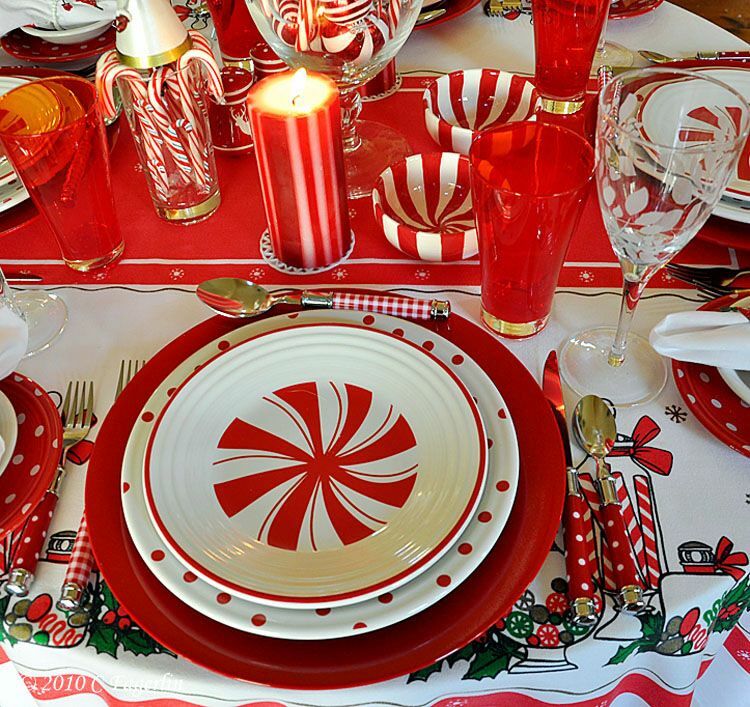 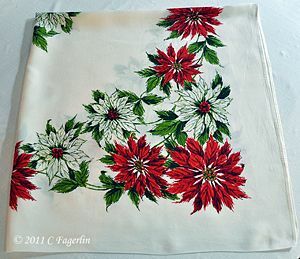 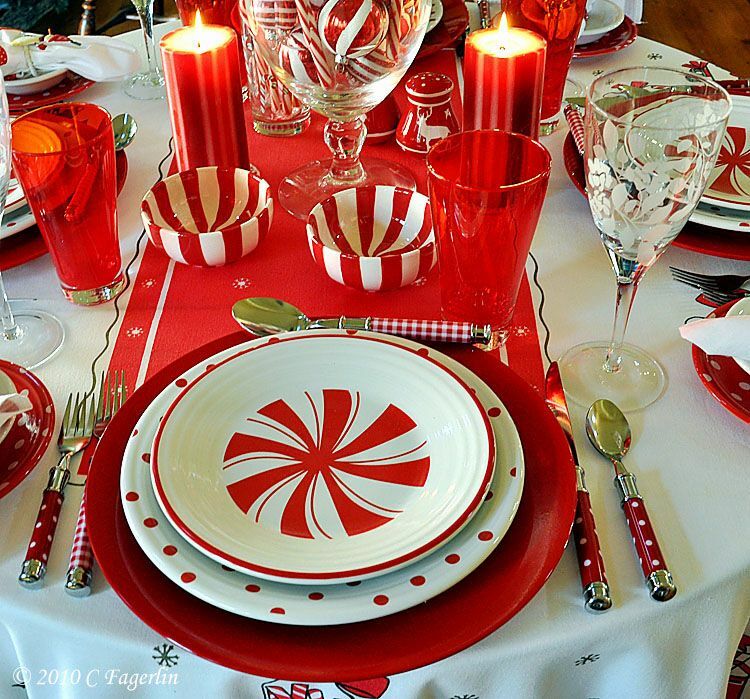 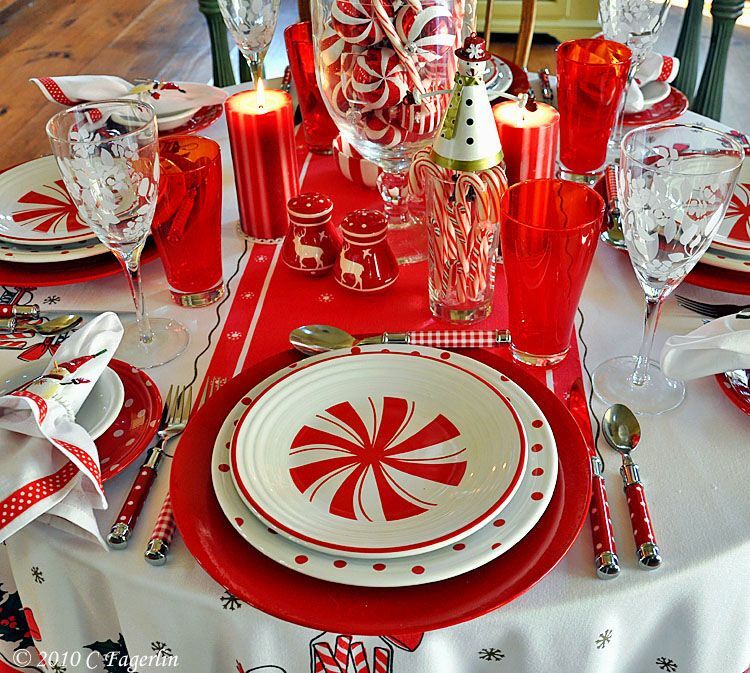 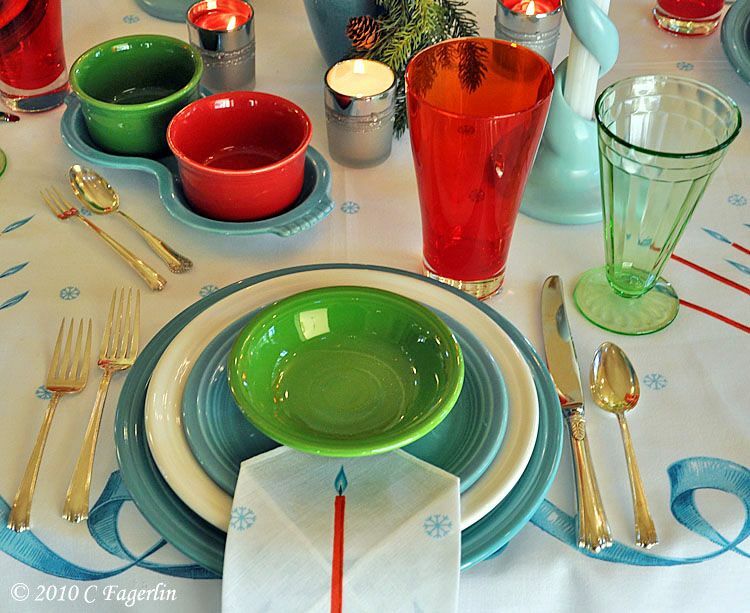 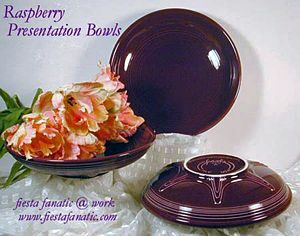 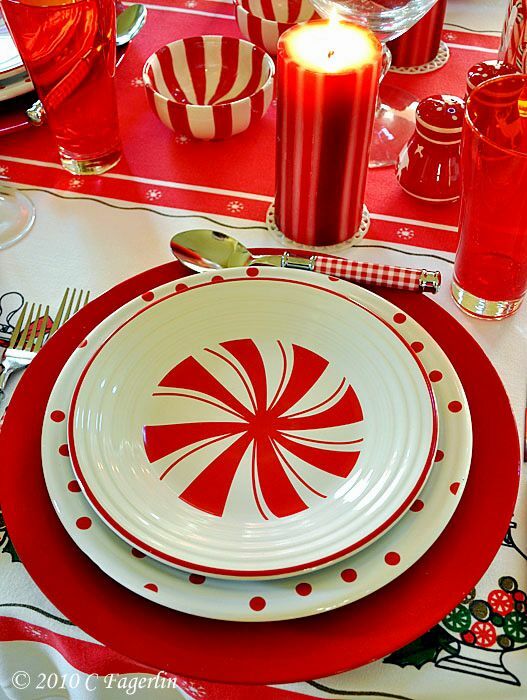 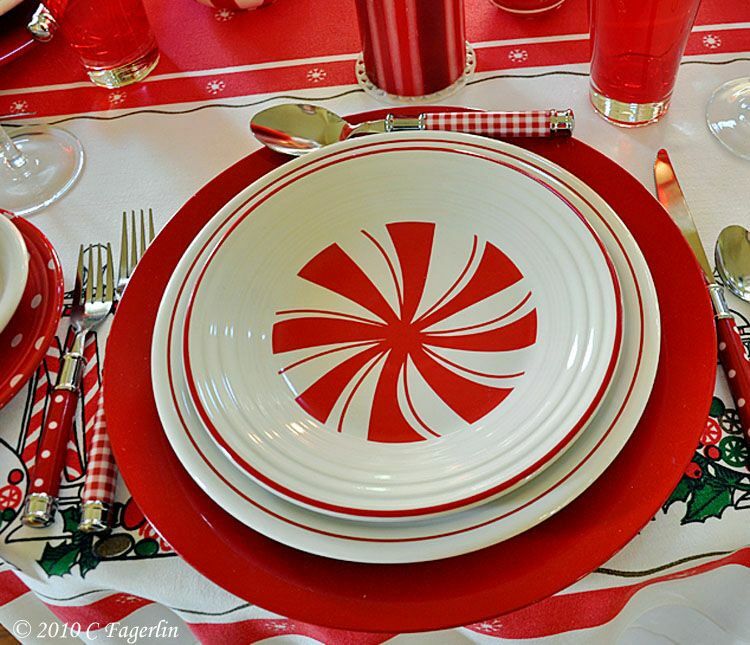 This is an alternate combination of these beautiful Fiesta patterns using the Peppermint luncheon plates with the Holly and Ribbon dinner plates. 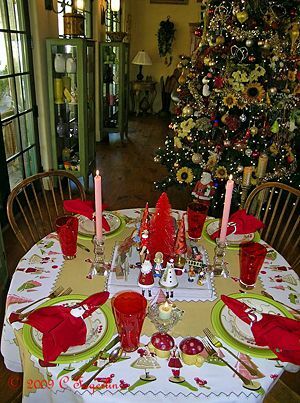 One of my favorites from Christmas 2010. 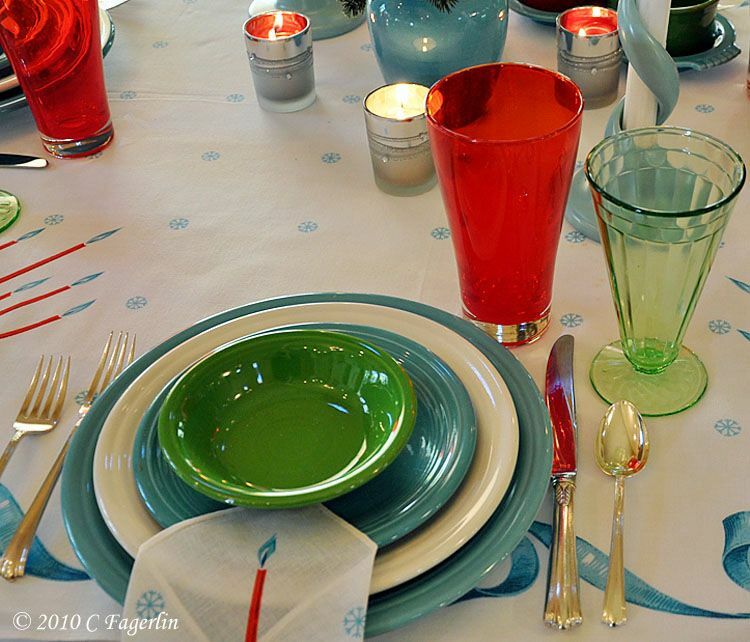 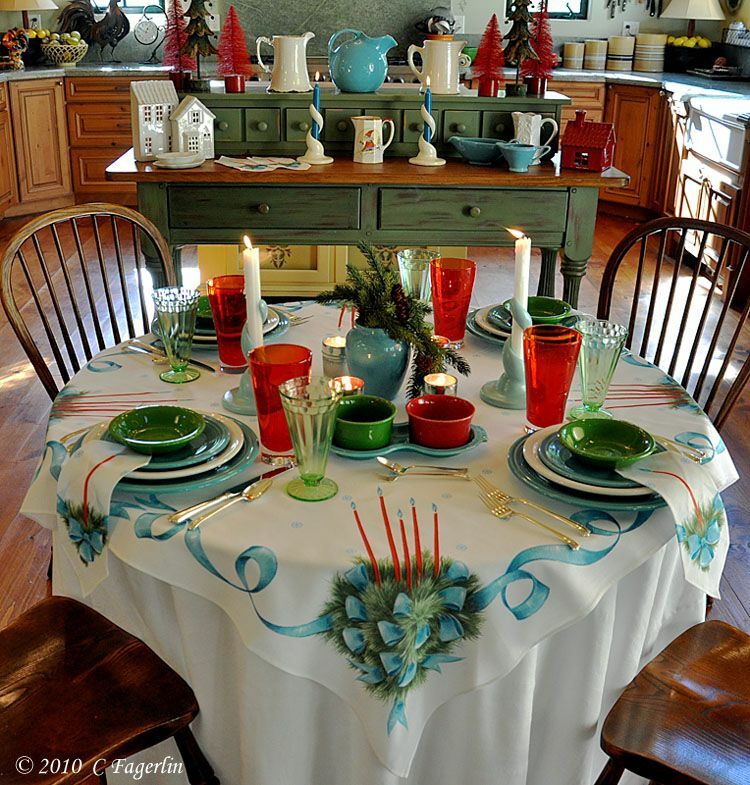 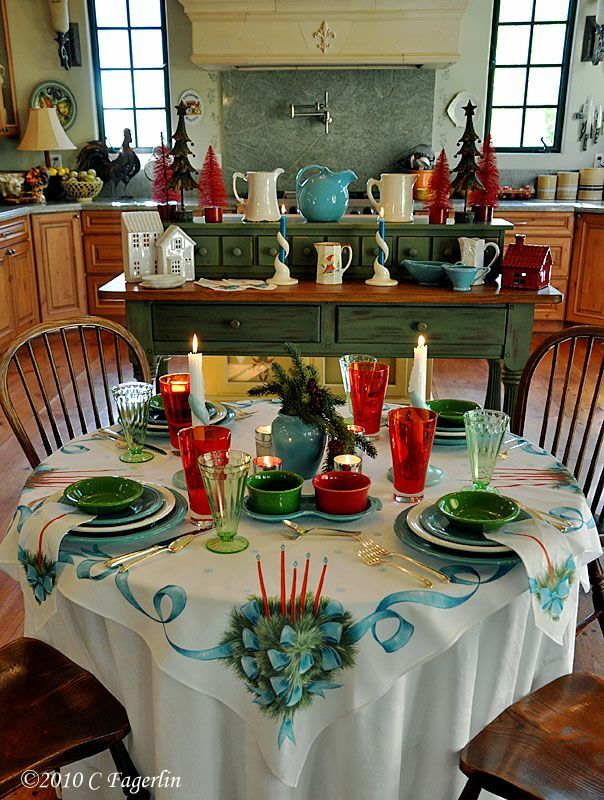 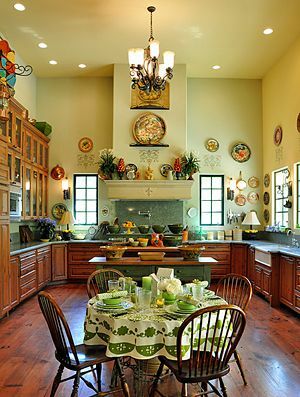 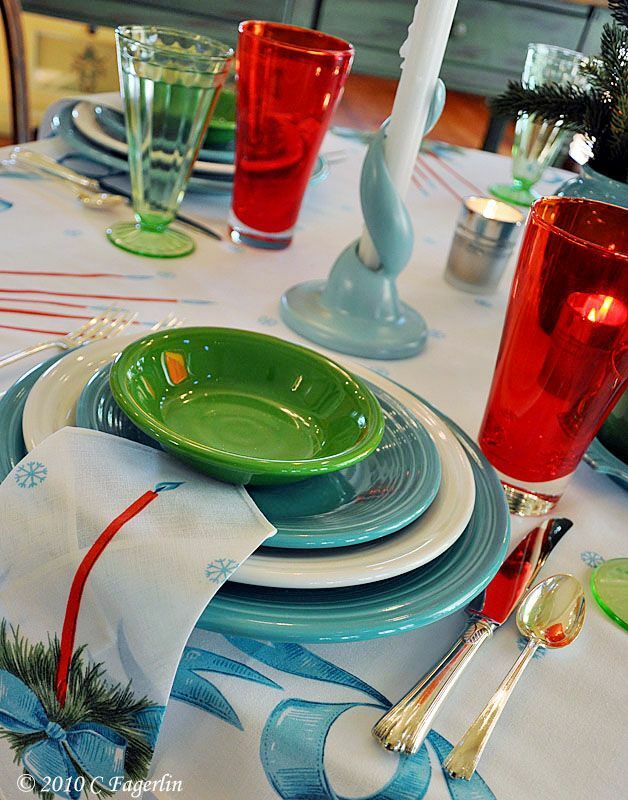 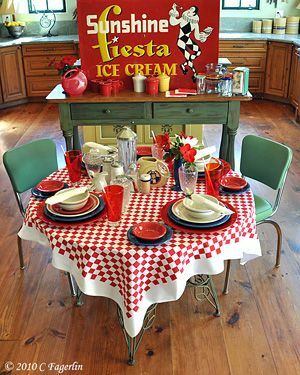 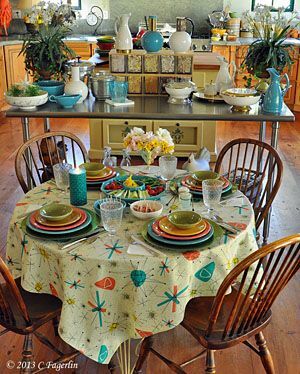 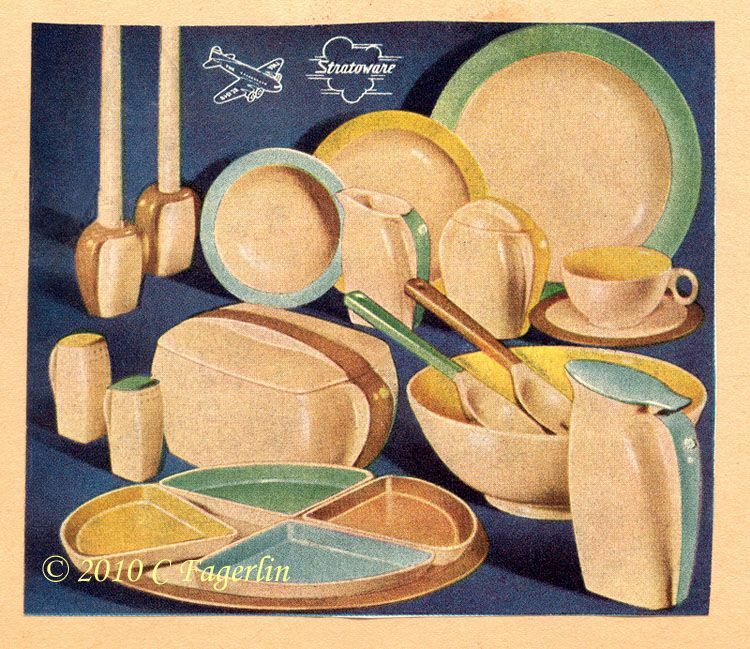 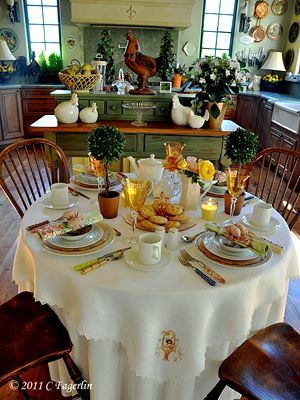 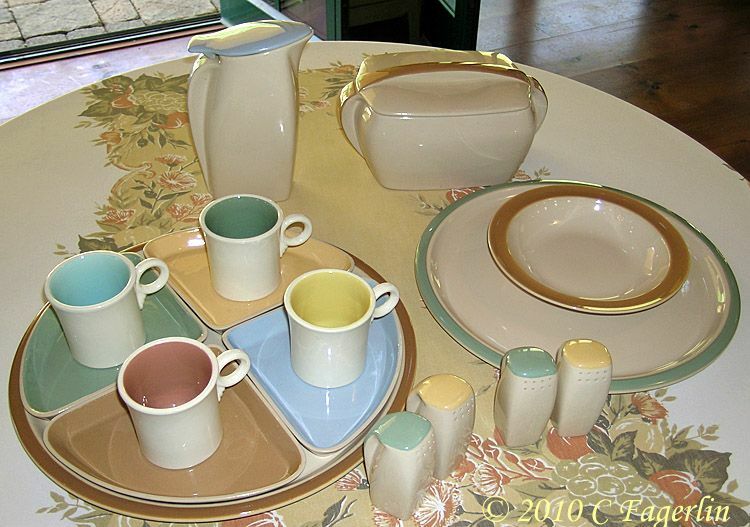 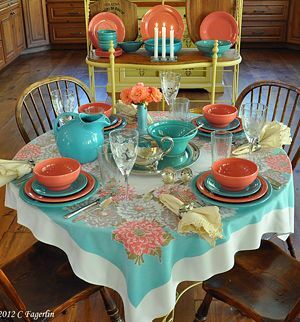 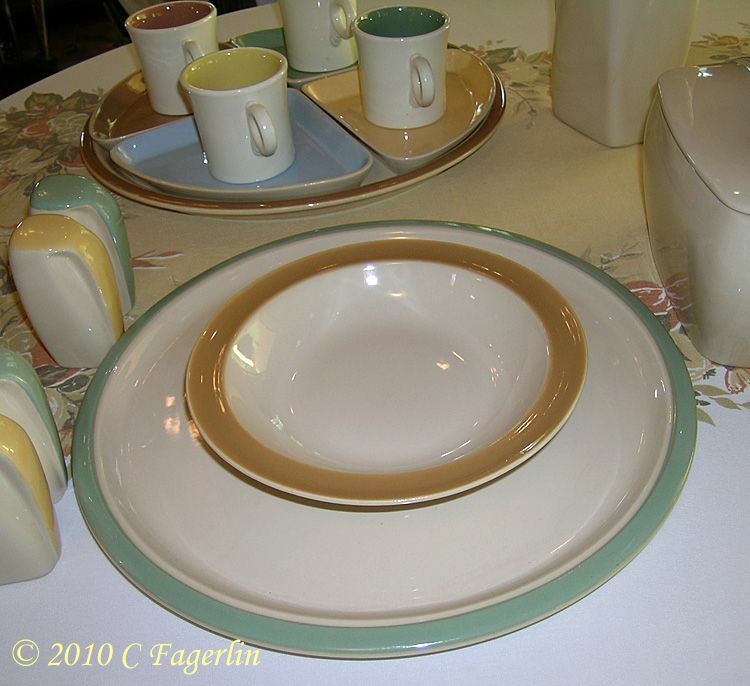 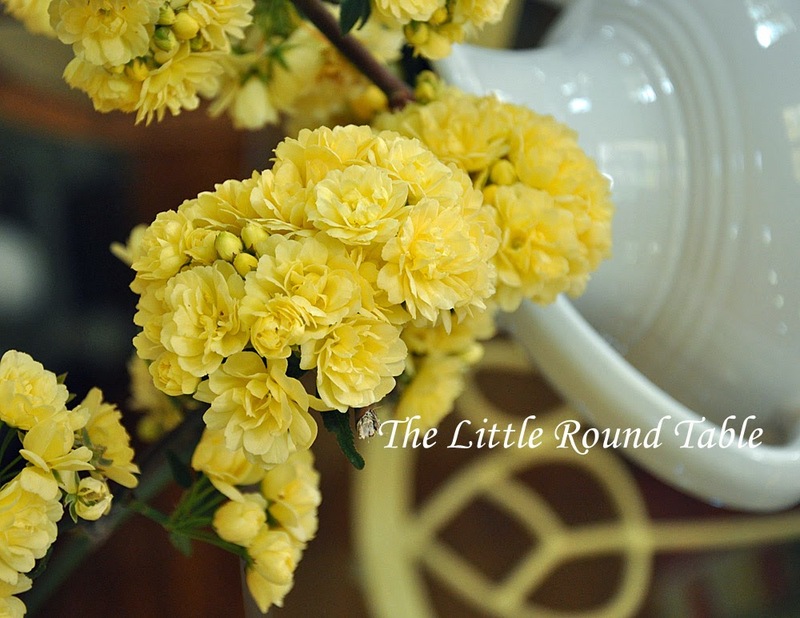 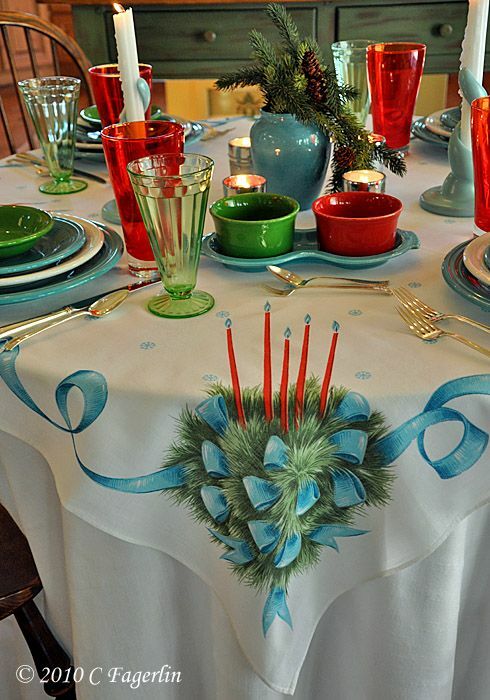 Both vintage and reissue Fiesta dinnerware is represented on this table. 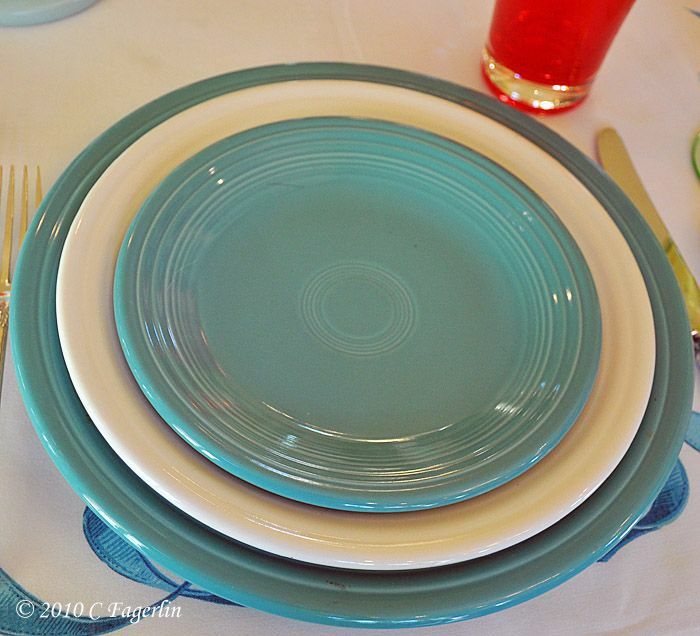 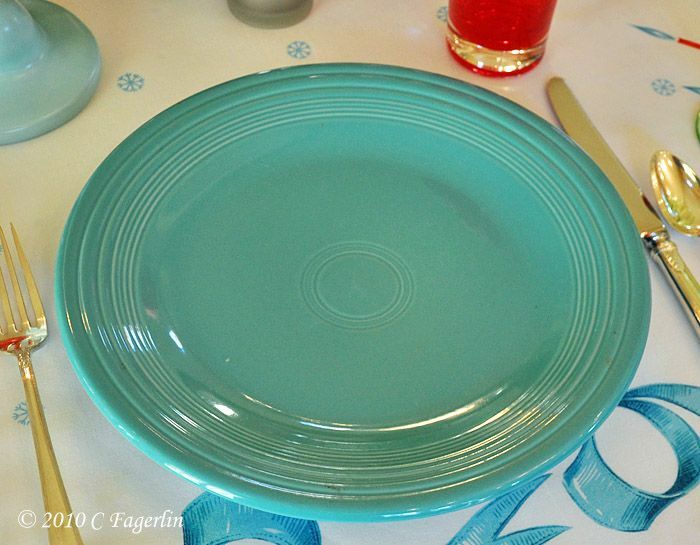 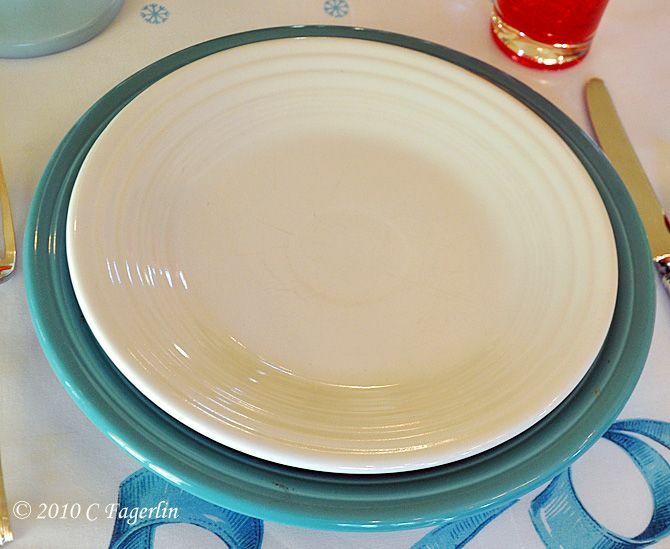 Shamrock, Turquoise and White plates are reissue. 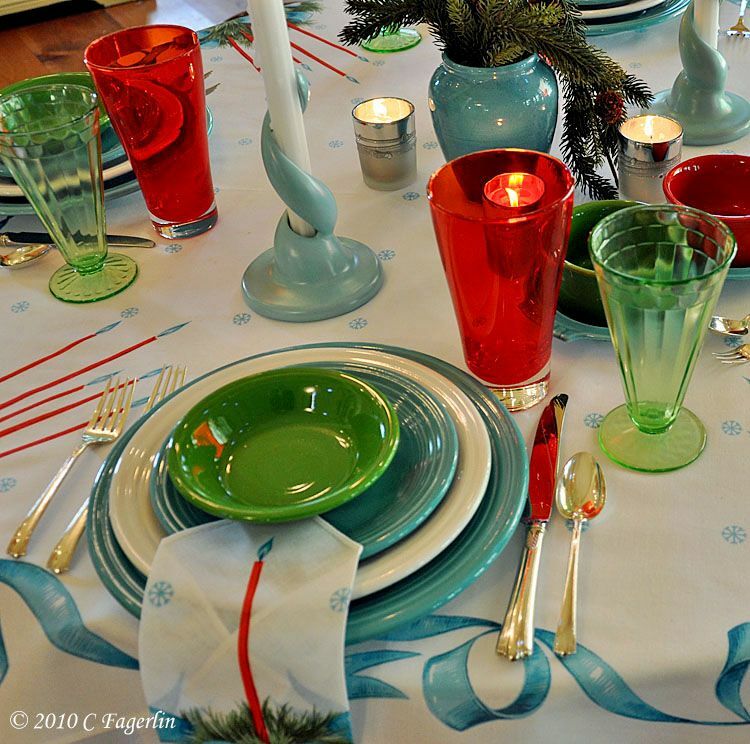 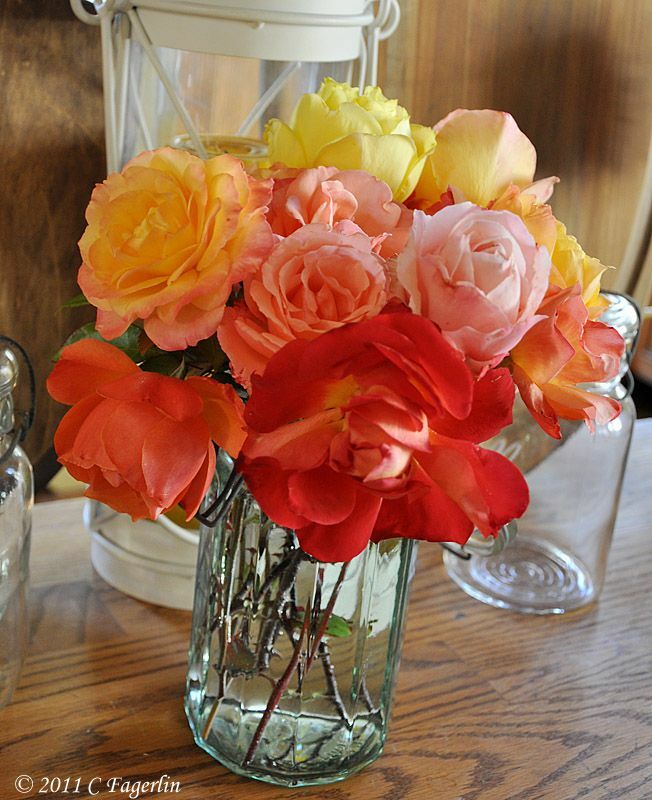 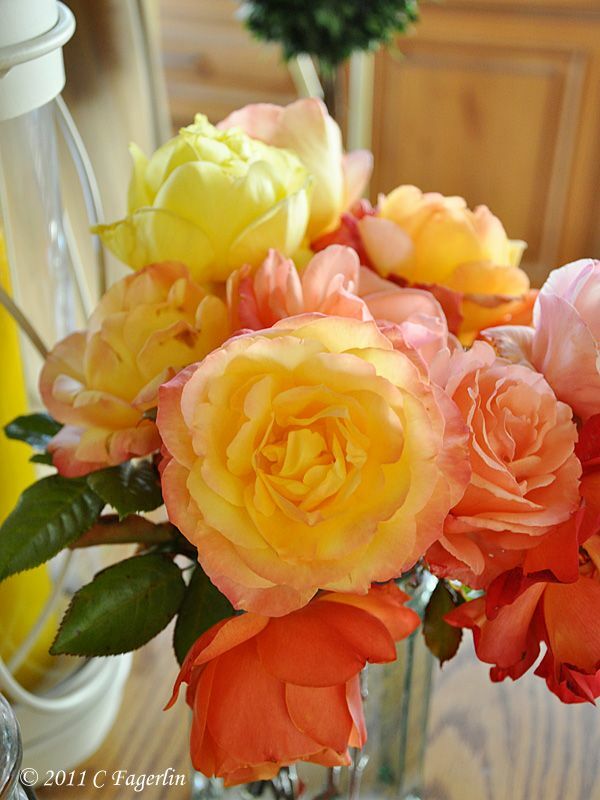 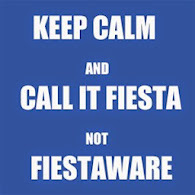 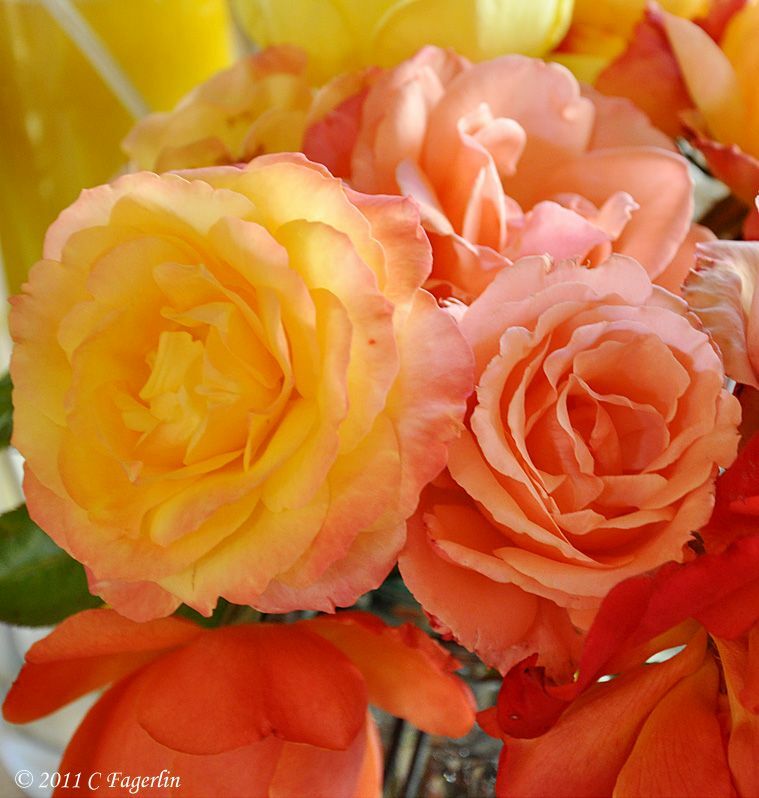 The center vase is Fiesta Turquoise from the 1939 World's Fair, where a working kiln produced souvenir pieces. 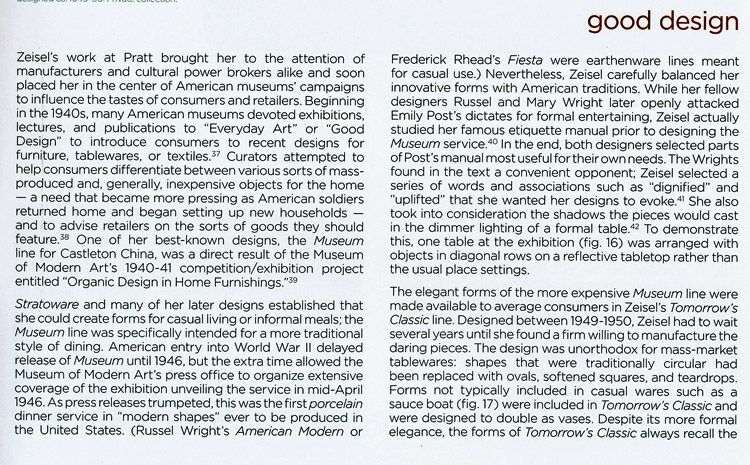 You can read more about that fair HERE. 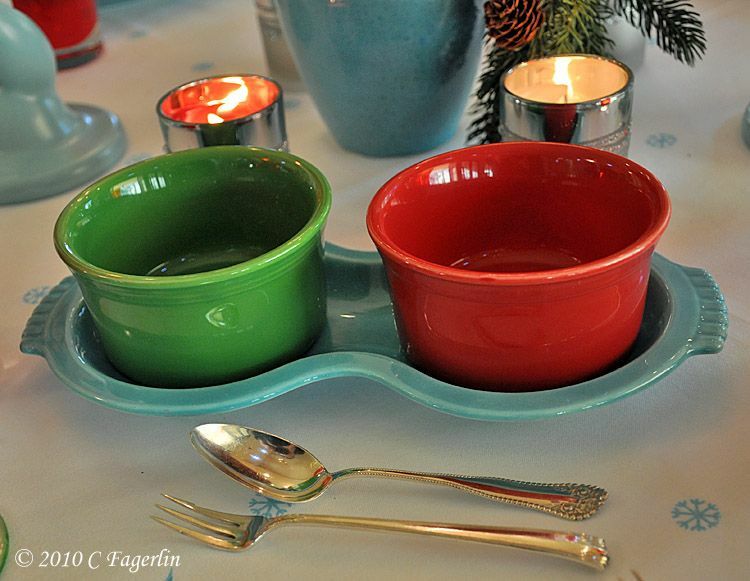 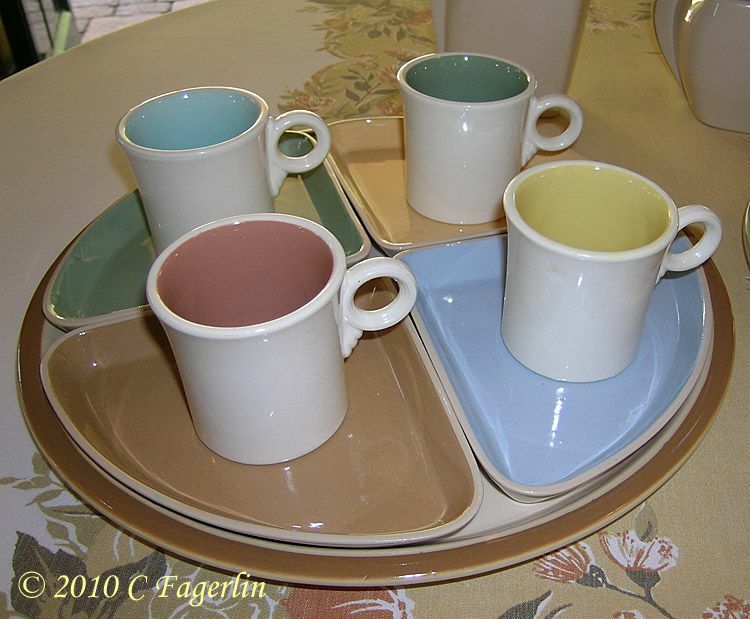 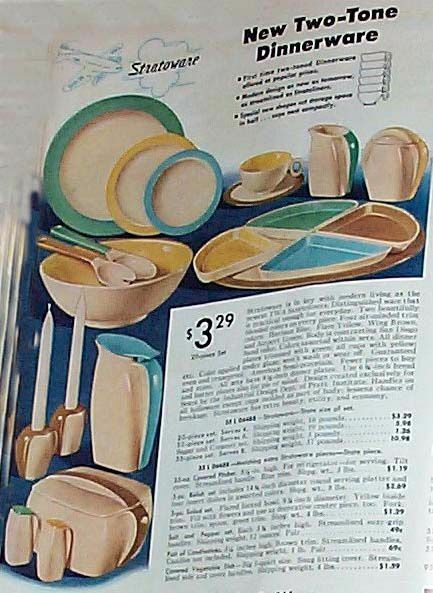 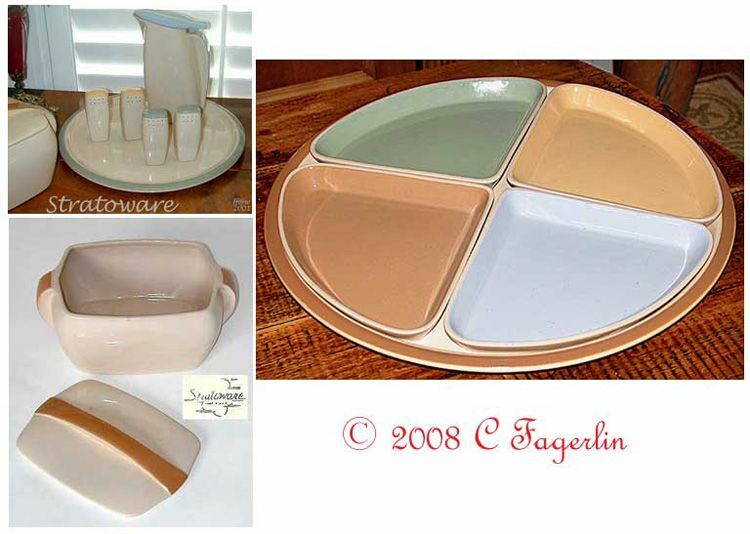 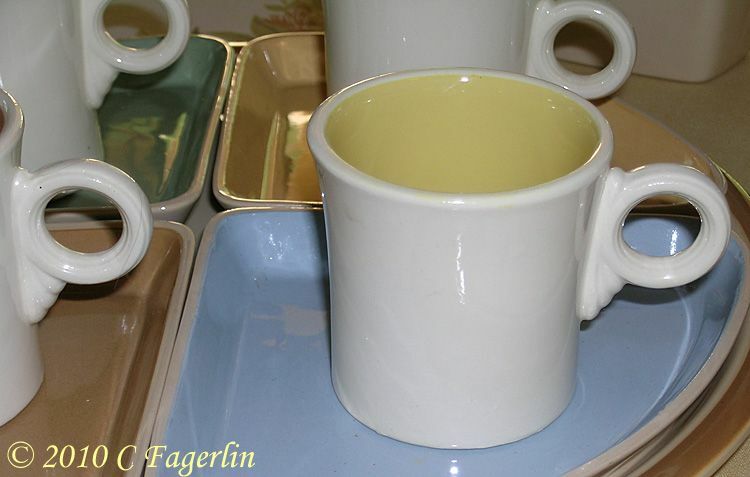 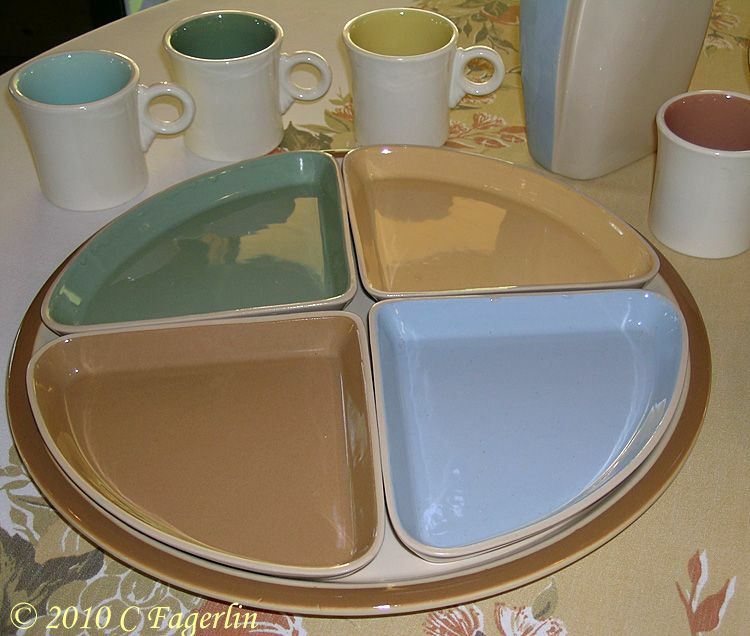 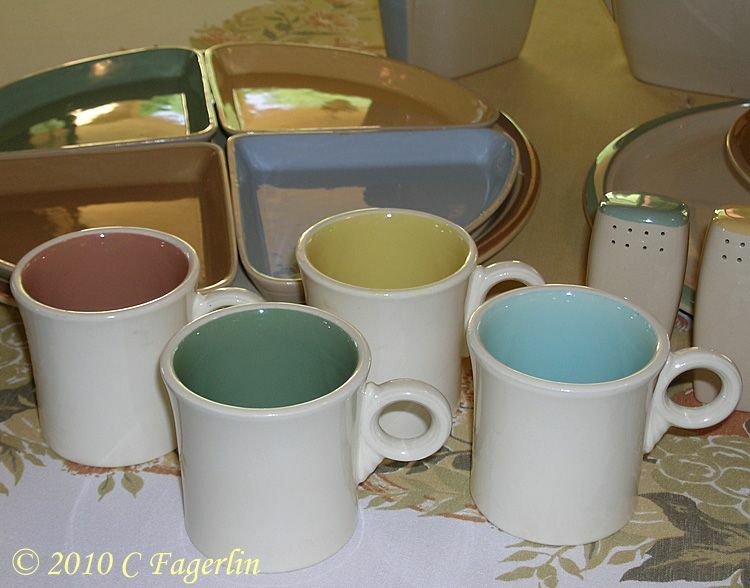 The vintage Figure 8 tray in Turquoise holds two reissue ramekins, rather than the vintage cream/sugar set it usually holds. 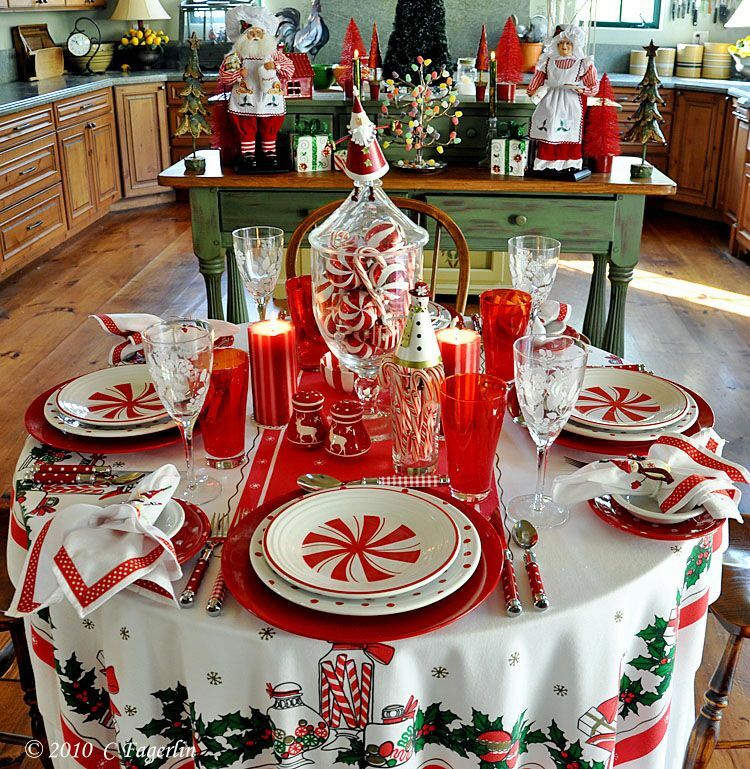 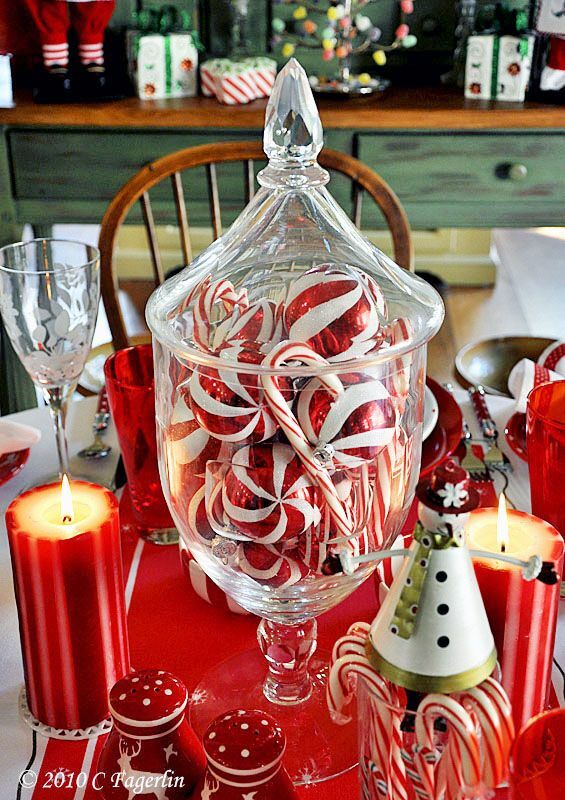 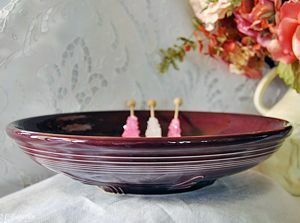 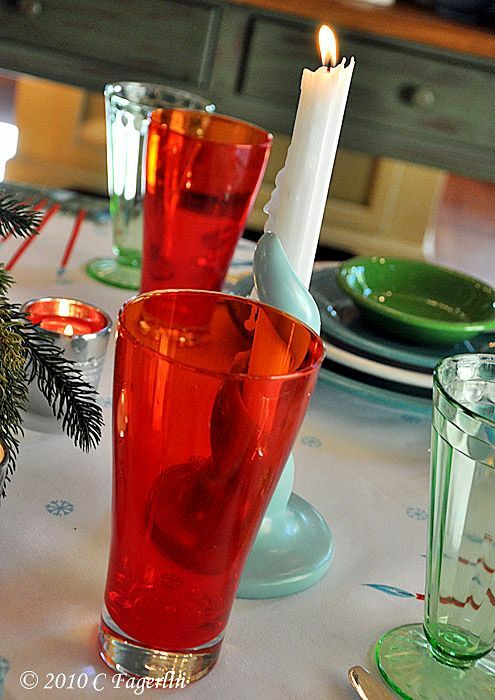 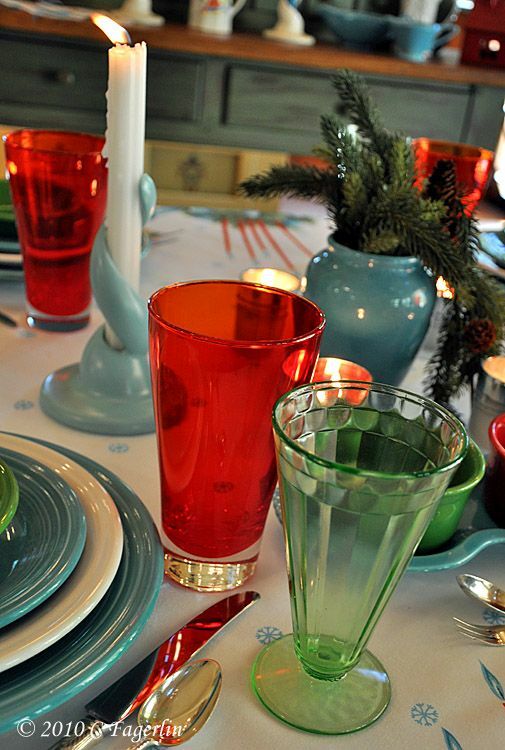 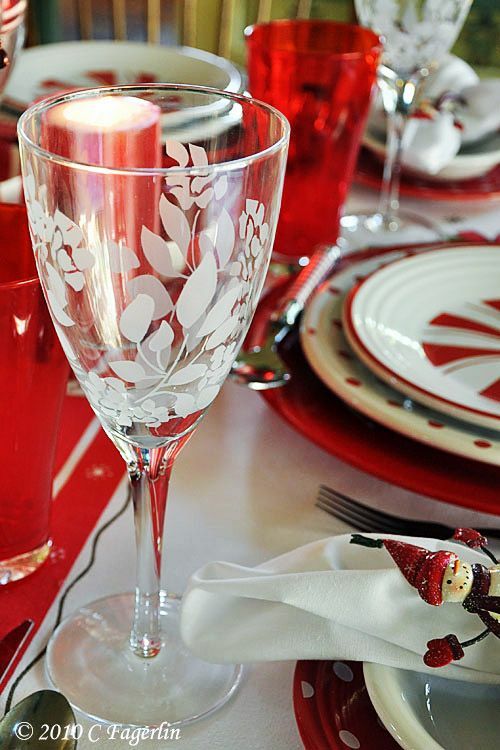 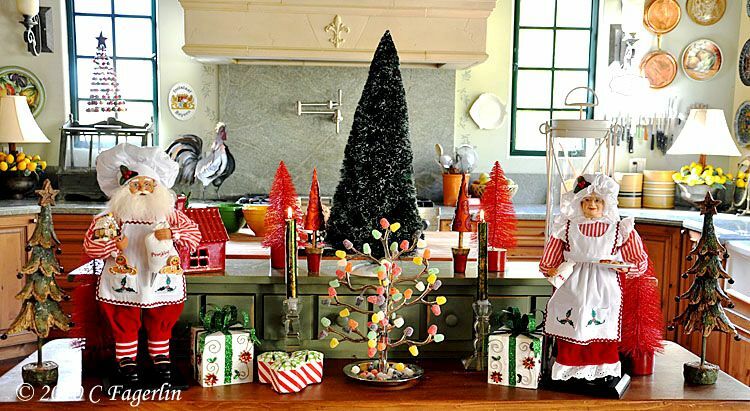 The spiral candle holders are vintage Metlox, sterling is American Directoire, vintage green Depression Glass is paired with red tumblers from Home Goods. 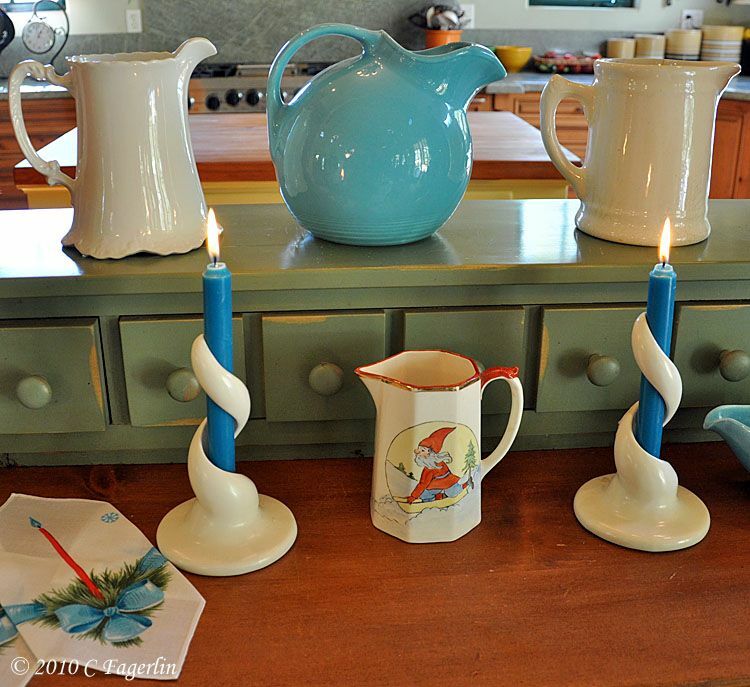 Ivory Metlox spiral candle holders and some vintage items from Homer Laughlin. 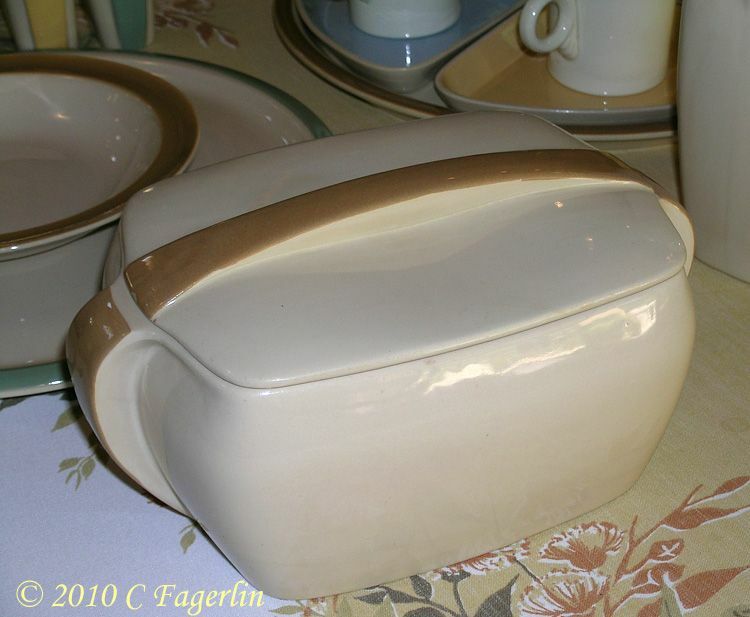 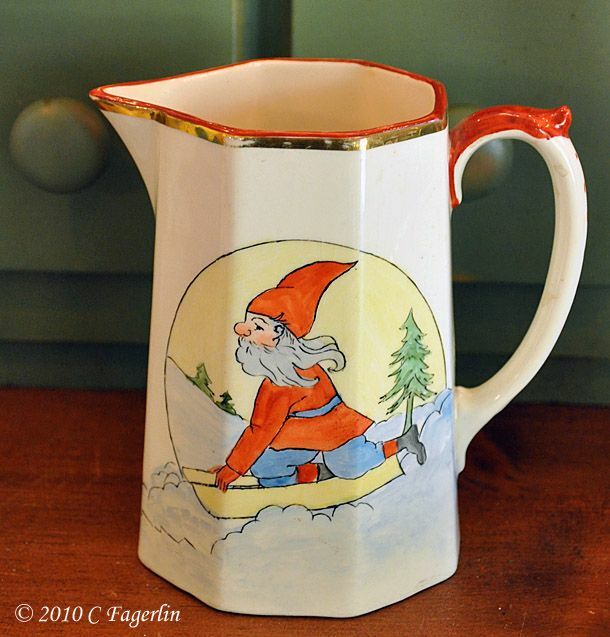 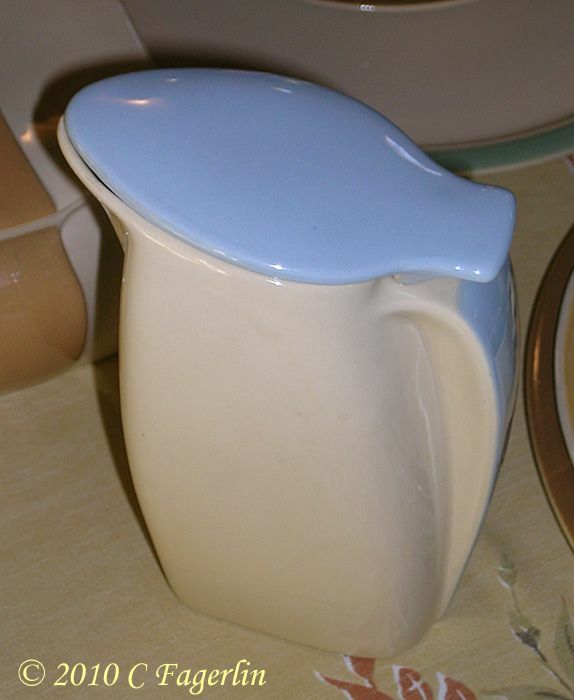 The Ball Jug is vintage Harlequin. 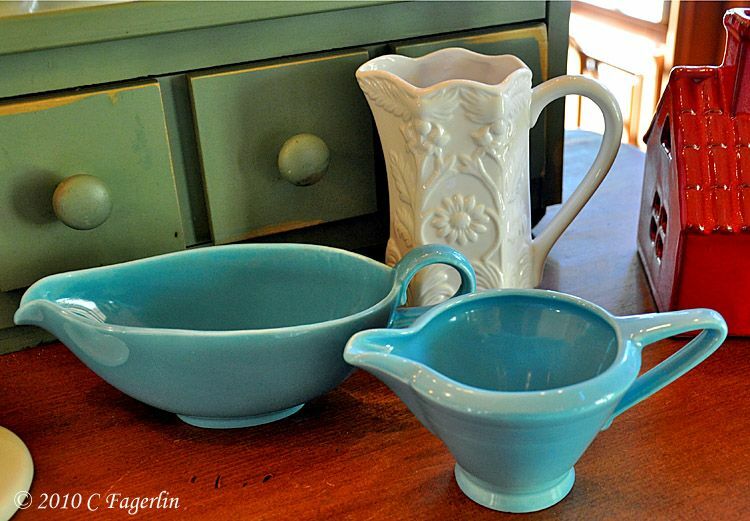 Little white pitcher from Home Goods stands with vintage Homer Laughlin Turquoise creamer and gravy boat.